Social media has taught us what society’s hot buttons are. You can hardly log onto Facebook without stumbling across a hot debate in your feed. The subjects of racism, sexual preference and religion are sure ways to get people talking — and arguing. Even the words, “racism”, “sexual preference” and “religion” prickle at our value systems causing us to alternatively throw them around defiantly or handle them with extreme caution. To openly write on these subjects is to make one’s way through a mine field laced with PC bombs, so we choose our wicked words carefully so that someone, somewhere won’t get offended. Unfortunately, this brings us no closer together, it closes off avenues to understanding and inhibits our ability to engage in civil dialogue. 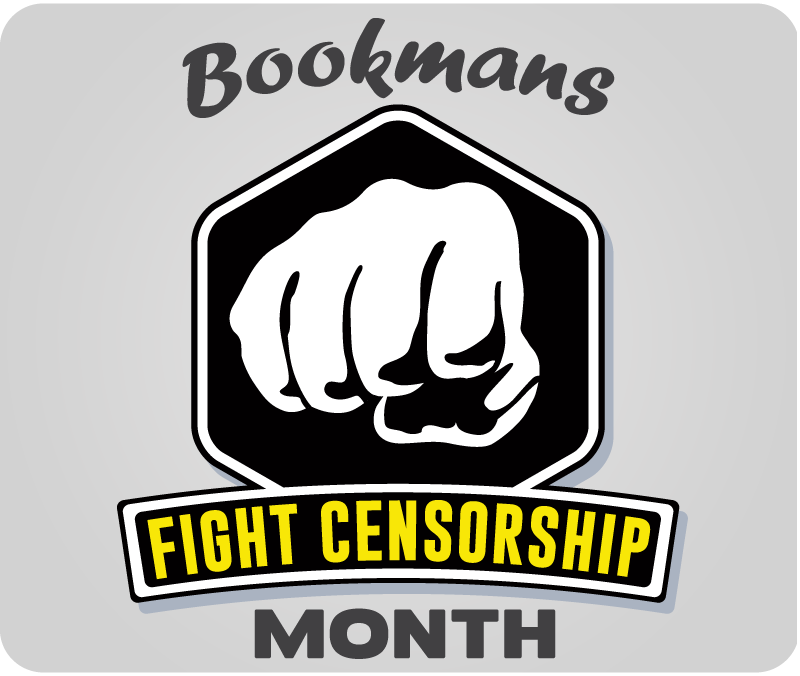 This month Bookmans focuses on our Fight Censorship campaign. We support and celebrate your precious freedom of speech and freedom to consume the speech of others, both oral and written. The written word is our record of all human thought, experience and knowledge. We live in electronically charmed times when digital shadows linger even after the words are deleted. Burning these stores of information lacks the efficacy it had when vandals set the Royal Library of Alexandria aflame, but that doesn’t mean we can relax, confident that we know everything and always will. As we make our way deftly though the minefields of what is or isn’t “offensive” let us take a moment to be happy, really and truly grateful that we CAN argue about sensitive issues. Every American citizen has a voice and many, if not most, have almost magical modern technologies that allow us to share our voices. More importantly, we have the ability and the right to explore the ideas of others with whom we might disagree. It’s nice to have an opinion, we all do, but they are stronger when defended with an understanding of all perspectives. I feel blessed (if I may use such a religious term) to live in an era where we seem to be making headway in equality, ethics, stereotyping and dogma. I hope we keep in mind that we got here by dragging taboo topics into the public light to examine, argue and debate them. Get Caught Reading Banned and Challenged Books at Bookmans!